The APZ / VZ series of manual rack presses are used for joining and forming with small press forces of 1.5-2.5 kN. Toothed rack presses are operated by manually depressing a gear-toothed-rack toggel which drives the press ram, which provides a uniform force profile over the entire travel of the stroke. Depending on the model, working strokes of 40-100 mm as well as adjustable working heights of 35-390 mm are available. An optional return stroke lock releases the return stroke only after the press has reached the bottom dead center, which ensures a constant injection depth. The return stroke lock can be unlocked in any position. An adjustable stop limits the maximum insertion depth. A stop with a micrometer adjustment is available as an option. Optionally, the presses can also be equipped with a force/distance monitoring system. A left- and right-handed version allows a quick changeover of the toggel to the other side. The APZ series is equipped with round rams, while the VZ series has twist-resistant quadruple tappets. Manual rack presses of the series APZ / VZ are used for the cost-effective construction of workstations for the assembly and processing of small to medium series. By means of a constant force profile over the entire stroke, they are also suitable for press-in operations with longer travel distances. 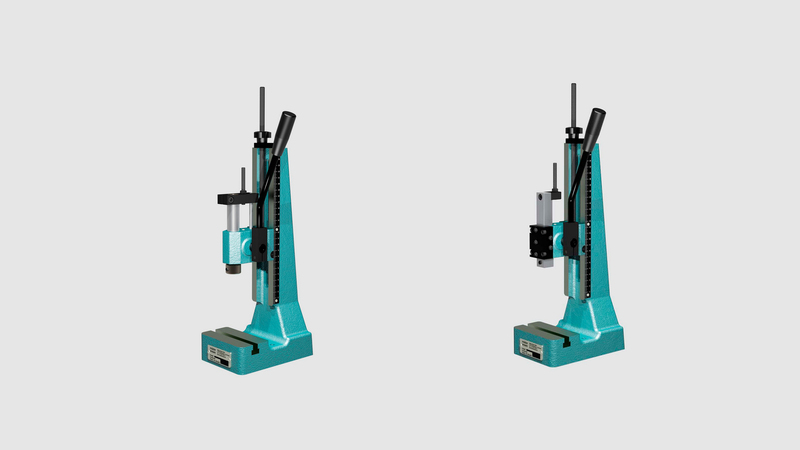 Due to the easy adjustability in a wide working range, rack presses are also suitable for changing products. Optionally, production in monitored and documented quality is possible, for example, in the automotive supply and automotive industry, aerospace engineering, medical engineering, mechanical engineering, electrical engineering and a variety of other industries as well as in the workshop sector.